I was a little suspicious when Natalie's preschool teachers asked parents to send in a favorite family recipe so close to Mother's Day. I obliged and jotted down the recipe for Skier's Cake, which is saved in my Blogger drafts file for a winter post, so you'll have to wait for it nah nah nah. When Michaela Byrd and I picked Natalie up from school on Wednesday, she was bouncing up and down with excitement, clutching a wrapped package to her chest. I promised I'd open it as soon as we got home. I was delighted to find an adorable cookbook with recipes compiled from Natalie's "Young 4s" class and the preschool administrators, P.E. teacher, music teacher, Spanish teacher, and church office worker. 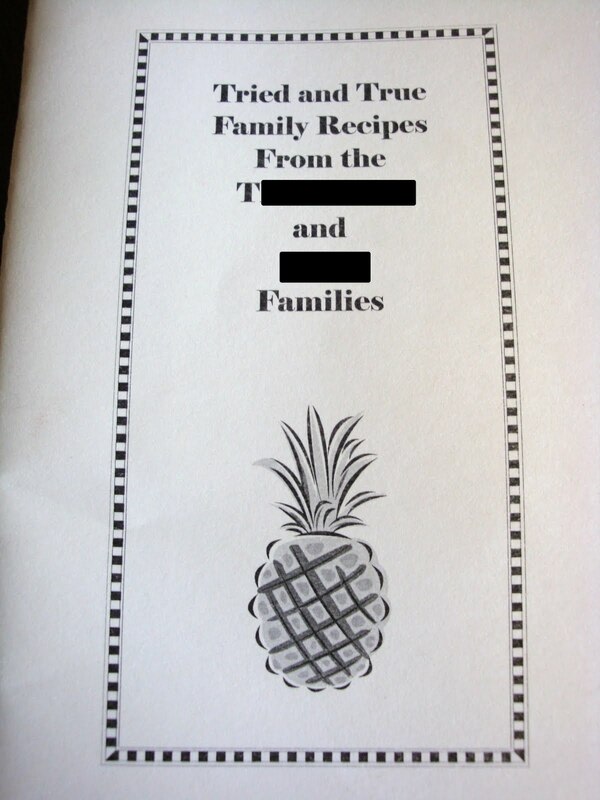 The mortifying part came when I realized that the teachers asked each child to dictate a "special" recipe to be included in the book. "Take the ingredients what are from a box plus eggs and put them in a bowl and stir. Then cook them for 10 hours and put them on the stove to cool off." Boxed brownies? Really?! She doesn't remember the 9732 times we've made blonde brownies from scratch? No, she remembers the times Mommy buys the Betty Crocker variety on sale at Target and cranks a pan out in 20 minutes. Sigh. I will forever be known to the other moms in the class as "that mom who makes brownies from a box." I am shamed. I share my shame with you because after I got over the humiliation (by making a box of brownies), I got to thinking that wedding season will be upon us soon and these little cookbooks are actually great bridal shower gifts! Find a set of cute recipe cards at your local stationary shop and insert them into a decorated binder after writing some of your favorites down. Use colored dividers for different categories. Be sure to include extra blank cards. Visit a site like Create My Cookbook and have one printed professionally for the bride-to-be. Make a copy for yourself if you like how it turned out. Use an 8x8 scrapbook album and create an embellished cookbook. My mother-in-law did this when T's brother got married in 2008. You can include stories behind each recipe, photos of family enjoying meals together, or a picture of the family member who shared the recipe with you. 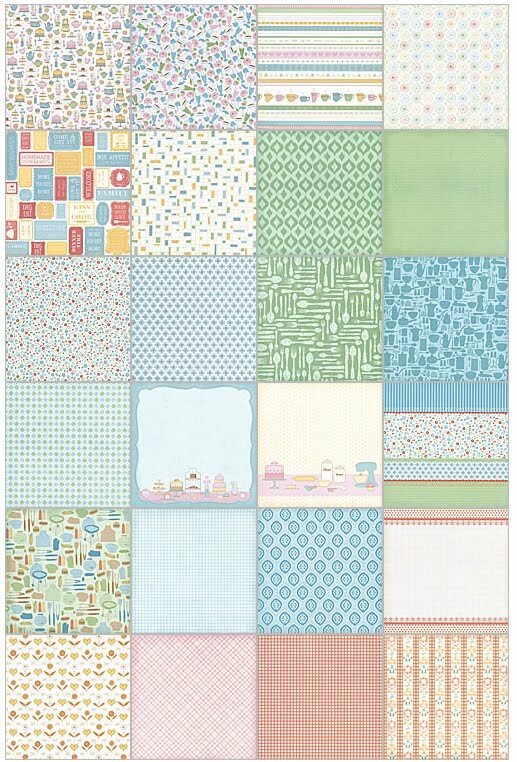 DCWV has an adorable paper pack with Kitchen themed papers called "Nana's Kitchen." T's mom typed up the recipes she used in the bride's recipe scrapbook and had them made into a little book that she gave to each family at Christmas. Each person's name was at the top of the page with their recipe. You could even go a step further and include the recipe donor's birthdate/marriage info. and it would be a lovely genealogical gift to future generations of the family. So there you have it. You can turn my mortification into something useful. If you start looking through your cookbooks now and emailing family members, you'll have plenty of time to complete a DIY cookbook by wedding season...or Christmas. 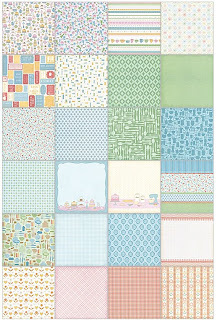 I'm linking to Kimba's DIY party at A Soft Place to Land today. I didn't know there was any other way to make brownies, but from a box, lol! Don't worry to much about it, the other mom's bribed their children to say something other than the boxed kind, we all do it! Good idea for a bridal shower gift! Hahahaha....I feel your pain, my friend! Yesterday at church all the mother's got a hand made tile that their children wrote messges on for them. When I read mine, I wanted to crawl in a hole and die right there. My 10 year old said...I love you even even when you are mad at me...happy mother's day. My nine year old said...I love you even though I am bad and get in trouble sometimes...happy mother's day. SERIOUSLY??? Needless to say, I sort of felt like "Failure Mom..... "Monster Mom" ...."Mean Mom". But I'm totally over it now. Can you tell? That's cute. At my son's preschool another class had a list of what each of the kids love about their mothers. One was "I love her because she cleans my room" and another was "I love her because she buys me toys". Kids are funny! For my wedding my aunts/cousins/etc each wrote down a favorite recipe of their own. They put all of the index cards inside a binder with plastic sleeves. I liked the idea! I think it's adorable! And I'm willing to bet you arent the only mommy who makes boxed brownies. I've never made them from scratch, ever! Nothing embarrassing about that...brownies from the box are usually better than homemade! Why go to all the extra effort? You don't have anything to be ashamed of!! Making brownies from a box is just as fun to her as making them from scratch. Just that you were together is what matters! And the AFTER of getting to eat them warm from the oven! Don't be ashamed to take a short cut. Life is too short to ALWAYS take the longer route!! That's hilarious. I received a similarly mortifying Mother's Day gift, so I can relate. My daughter's teacher had them put together a Mother's Day book by asking them questions about their mothers. Imagine my chagrin when Lily finished the sentence, "My mom looked pretty when..." by writing, "when she wore a t-shirt and jeans to a wedding." Just another reminder that motherhood keeps you humble! homemade gift! love it! and what a nice touch to include all the recipes from the classmates! i'm sorry that your brownie recipe made the cut, too :) i have a recipe card from my son in kindergarten that is his version of my mac & cheese... a treasure to be sure! A recipe book is a great idea. Creative Memories has a digital recipe kit for their Storybook Creator Plus program. Then the books are hard bound and will last at least 100 years! My mom still has the cookbooks we made for her when we were in elementary school. I don't remember what my recipe was, but I read it not too long ago and someone had boxed macaroni and cheese as their recipe. I hate to think what my kids would list--we've been eating a lot of convenience food while we remodel and get ready to move. Cute story though. I love the idea of making a cookbook like that though! Have a wonderful week my friend! That is so cute! :) And hey, boxed brownies are sometimes pretty awesome, especially when they're on sale! Stopping by from SITS, happy Monday! I almost always maked brownies from a box. Even my caramel brownies that I loooove are from a cake mix. It's okay. We all do it. What a great gift idea with the cookbook, especially if it's someone who doesn't know how to cook!!! I know several who can't boil water. HMMM! Thanks for the idea! Hope you had a great Mother's Day despite the embarassment! Oh, too funny. Thank you so much, Natalie. So nice to know of your appreciation for mom's home cooking! All joking aside, that's a great idea for the wedding gift. My aunt gave me a wooden recipe box complete with several favorite recipes she'd copied onto cards. I still treasure it, 25 years later. Our computers would make that kind of gift a little easier to put together but no less thoughtful! Happy Mother's Day week to you! I totally did this exact same thing in preschool. I actually remember posing with the chef's hat. My mom still has it, and I dictated Macaroni and Cheese. I never thought about the fact that it may have embarrassed my poor mom, who made such lovely meals. I had to laugh! This actually made me laugh out loud ... out of the mouths of babes. I recently spent quite a bit of time (and money on good cheese) to make Ina Garten's baked mac and cheese ... my daughter (13) said that it wasn't quite as good as the Velveeta Shells & Cheese! WHAT! Kids. Recipe link in my blog post below. Ha kids say the darndest things, that is so funny! Cute idea though. I thought that was a clever idea. You and Natalie will probably laugh about this story in years to come. I love your first picture of Natalie. She has the most beautiful eyes! Dont be ashamed of the boxed brownies! Embrace it! What an adorable idea. I can just see how excited she was to share this with you. How precious! And don't feel ashamed about boxed brownies. She only remembers that you did them together. And that is what is important. hehe...my daughter shared a recipe for a preschool recipe book as well..and some of the things that came out of her classmates mouths wer priceless! No mortification necessary...you are the only one who's worried about it. Promise. That is precious! I have to tell you that I remember my kindergarten class doing this, and the recipe I dictated was for peanut butter and jelly sandwiches! that's such a great idea! Love how they included a recipe from the children's prespective. Any chance you could share your blonde brownie recipe? I am alergic to CHOCOLATE... can you believe it! I need a GOOD recipe..
this is so nice idea. so cute gift for mothers on mothers day. Love this story! It's ok. Now it's a story to tell when she gets older. About the cookbooks, my mother asked both of my grandmothers to hand-write their favorite recipes on cards for a cookbook she put together for me. My paternal grandmother has since passed, and having her recipes in her handwriting, knowing she held those, is really meaningful to me. Just thought I'd share.